Asbestosis is a serious lung disease caused when asbestos fibers are inhaled and become lodged in the inner layers of the lungs. 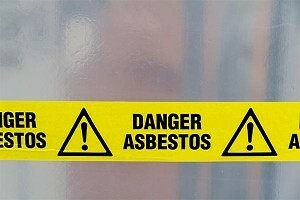 Asbestosis is not a type of cancer, and it is different from mesothelioma. Asbestosis begins when scar tissue is formed in the lungs (called “fibrosis”). The scar tissue slowly builds up and reduces the lung’s ability to deliver oxygen to the blood and remove carbon dioxide. In severe cases of asbestosis, the impairment of lung function can strain the heart, or even result in heart disease. The inflammatory process starts within hours or days after asbestos is inhaled and injury to the cells begins shortly thereafter. The inflammatory process continues to progress even when exposure to asbestos stops. The inflammatory process of asbestosis may go undetected for decades causing no pain or respiratory symptoms. In many people, the process eventually produces breathing abnormalities and radiographic changes. Usually, the first symptoms are shortness of breath and a dry cough. These symptoms often precede abnormalities on chest x-ray or pulmonary function tests. The period between exposure and diagnosis may range from 10 to 50 years. The first symptoms of asbestosis may be shortness of breath and a dry cough. These symptoms usually appear before any chest x-rays or pulmonary function tests are performed. As with mesothelioma, the incubation period is long and may not be diagnosed until 10-50 years after exposure. Presently, there is no treatment that can cure asbestosis. Instead, treatments are put in place to improve a patient’s quality of life. There are three main types of treatments for asbestosis, which are surgical treatments, drugs, and alternative treatments.